Very interesting email I received on one of my favourite topics. If you measure what is going in it strikes me what is coming out is equally important. After all doctors used to taste your urine 🙂 It’s interesting how the FDA are getting drawn into the debate. Basically if you interept the dipstick manually it’s OK once you use a camera & computer it becomes a medical device! see here. After our US and India app releases, it has been an interested time! Also interesting development: uChek is a FDA registered device and we have been in discussions with the regulator about the classification of the product. Much commentary about this on the web. Like here. We seem to be somehow in the center of a wider debate about innovation and regulation. A simple 10 parameter dipstick (less than 20 cents) can be a powerful diagnostic tool. This is precise the type of test strip we read using the uChek app, through the iPhone’s camera. Such a standard urine test strip may comprise up to 10 different chemical pads or reagents which react and hence change color when immersed in, and then removed from, a urine sample. The readings can be obtained between 60 and 120 seconds of dipping. Each parameter has to be read at a specific time after the start of the reaction, as per the manufacturer’s instructions. There are many manufacturers and many types of strips. Information about concentration measurements of parameters like glucose, urobilinogen, pH, ketone, occult blood, protein, bilirubin, nitrite, leukocyte, and specific gravity in urine may be obtained in this way. The absence or relative concentration of different parameters may provide inputs for healthcare professionals for diagnosis, and management of upto 25 medical conditions. Glucose is not normally present in the urine. Once the level of glucose in the blood reaches a renal threshhold, the kidneys begin to excrete it into the urine in an attempt to decrease the blood concentration. So high blood concentrations lead to glucosuria, as does conditions that may reduce this renal threshold. Produced as a by-product during the degradation of RBC in the liver and normally excreted in the bile. Once in the intestine it is excreted in the faeces (as stercobilin) or by the kidneys (as urobilinogen). Not normally found in the urine, ketones are produced during fat metabolism. The specific gravity (SG) of urine signifies the concentration of dissolved solutes and reflects the effectiveness of the renal tubules to concentrate it ( when the body needs to conserve fluid). If there were no solutes present the urines SG would be 1.000, the same as pure water. It also reflects a high solute concentration which may be from glucose (diabetes or IV glucose) or protein. Classified as microscopic or macroscopic haematoria. Microscopic means that the blood is not visible with the naked eye. Blood may be present in the urine following trauma, smoking, infection, renal calculi or strenuous exercise. Damage to the glomerulas or tumours which erode the urinary tract. Damage caused by the passage of kidney stones. The presence of myoglobin (myoglobinuria) after muscle injury will also cause the reagent strip to indicate blood. Measures the hydrogen ion concentration of the urine. It is important that a fresh sample be used as urine becomes more alkaline over time as bacteria convert urea to ammonia (which is very alkaline). 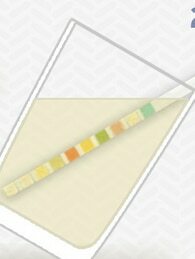 Urine is normally acidic but its normal pH ranges from 4.5 to 8. Foods such as acidic fruits (cranberries) can lower the pH, as can high a high protein diet. As urine generally reflects the blood pH, metabolic or respiratory acidosis can make it more acidic. Other causes of acidic urine include diabetes, diarrhoea and starvation. May be associated with renal calculi. This is measuring the amount of albumin in the urine. Normally there should be no detectable quantities. Elevated protein levels are known as proteinuria. Albumin is one of the smaller protiens, and if the kidneys begin to dysfuncion it may show an early sign of kidney disease. Normally present in the urine in small quantity. Less than 1% of urobilinogen is passed by the kidneys the remainder is excreted in the faeces or transported back to the liver and converted into bile. Nitrites are formed by the breakdown of urinary nitrates. This us usually caused by Gram-negative and some Gram-positive bacteria. So the presence of nitrites suggests bacterial infection such as E.coli, Staphylococcus and Klebsiella. Commonly found during a urinary tract infection. Detects white cells in the urine (pyuria) which is associated with urinary tract infection. Urinalysis may be useful in investigations and management of the following conditions. Addional information on this topic may be obtained from the sources below. 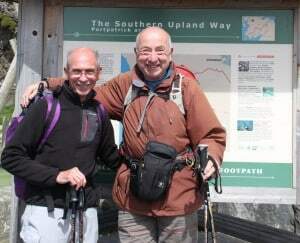 Today with George (who I first met 50 years ago whilst doing the Duke of Edinburgh’s award scheme at Parkgate Iron & steel works) I started the Southern Upland Way. This is a 212 mile coast to coast walk across Scotland starting in Portpatrick near Stranraer. This is the first time I have pre-booked the trains at either end plus the ten b&b’s in between. 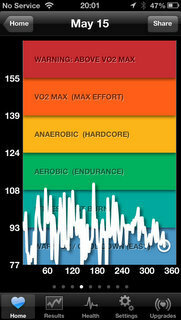 Another first is I’m using my new Polar H7 heart monitor with the iCardio app on the iPhone. When we left George’s house in Kendal it was hammering down with rain. However, by noon when we arrived at Portpatrick all was clear but with a very cold wind blowing hard. The walk is, so far, well marked although with a fair bit of road/track walking today. The moorland bits were very boggy with no refinements such as gravel or paving slabs like on other National Trails. The Via Ferrata bit is a chain handrail alongside straightforward steps in the rock. Today I’m off to Amsterdam for the weekend to spend time & learn more about the Quantified Self. Something I have been very interested in since discovering John Walkers original Hackers diet & Eatwatch programme on my old Treo600. This, coupled with the fact I had an eye problem which necessitated many visits to Addenbrookes Hospital to ascertain if it was genetic or glaucoma, made me realize how important good longitudinal studies are. Using Fatwatch (iPhone rough equivalent of Eatwatch) and Withings scales. 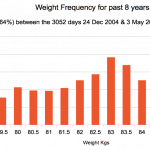 I now have 1950 readings from the past 8 years from the chart you can see a highly skewed distribution of weights. One side affect of this is that I now know I have spent 1109 nights away from home in the past 8 and a bit years 🙂 Since I only weigh myself at home! 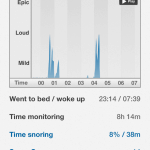 I tried Zeo & SleepCycle but didn’t get on with them. I now use the Fitbit and Snorelab. 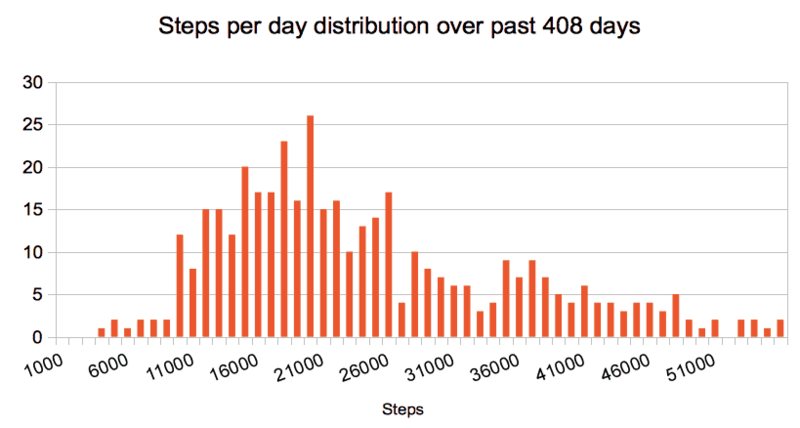 Fitbit has an API which enables me to draw nice charts from all the data it collects. 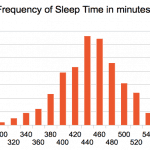 The shows shows a normal distribution centred around 440 and 460 mins (about 7 1/2 hours) of sleep in the past 416 days. Snorelab has no API 🙁 so hard to do nice graphs over many weeks, although I might enter all the data into a spreadsheet by hand. Obviously you can do screen shots like the example shown. 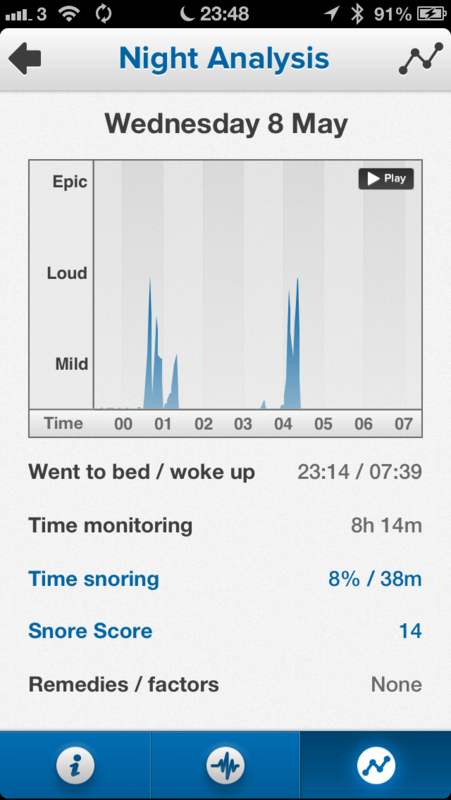 All it has proved is that I snore a lot! mainly when I first go to sleep. I am a keen walker as you can tell by reading this, and looking at my step counts on the chart. 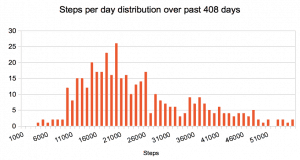 I did a post on the different ways I measure steps etc here. and probably a few more after the weekend!